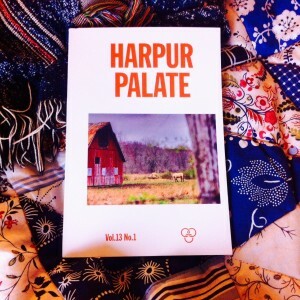 I have been enjoying my contributor’s copy of Harpur Palate on the slightly bumpy and very delayed train to Manchester this evening. I must admit that I wasn’t familiar with the journal, but apparently it has been around for some time, published out of Binghamton University in New York, as this is volume 13, no. 1. The magazine has a fun, blocky feel with rust-orange typeset and invert leaf pages (white on orange). The poems are quirky and interesting, including a concrete poem about moths and gnats by Joel Allegretti that literally swarms all over the page. I have two pastoral poems in this, their Country Living issue. At first glance, I would seem to be the only one representing the English countryside. The first of the two poems is dedicated to a fellow expat, inspired by her father’s name for light rain on their American farm. I continue to see the landscape here through the eyes of a transplant, still so foreign to my California desert upbringing, still bemused by the abundance of precipitation.